Powers/Abilities: Judas Traveller can alter the perceptions of others, casting intensely realistic illusions; due to his own mental instability, he believes these illusions to be real himself. Via his illusions, Traveller made others believe that he could shapeshift into a bird, fire energy blasts, conjure an impenetrable fog, teleport, shrink and grow objects and people, and travel through time. Traveller is telepathic; he can read the minds of others, and selectively delete information from them. Many of Traveller's apparent feats were unwittingly realized via Scrier's advanced technology. (Amazing Spider-Man I#417 (fb) / Spider-Man: The Osborn Journal#1 (fb) ) - Criminal psychologist and philosopher Dr. Judas Traveller was world-renowned for his theories about the nature of good and evil, earning the admiration of both Dr. Ashley Kafka and Norman Osborn. Obsessed with his work, Traveller suffered a complete nervous breakdown and went into seclusion. Traveller's mental breakdown triggered his latent mutant powers, giving him the ability to alter others' perceptions. Traveller became deluded, and came to believe that he was an immortal being who had travelled the Earth for centuries. Learning of this, crimelord Norman Osborn sent one of his costumed Scrier operatives, Charles Bates, to meet with Traveller. The Scrier convinced Traveller that he too was a mystical being, and proceeded to manipulate Traveller to Osborn's ends. The Scrier also helped recruit a group of students he called the Host: the mercenary Medea, the tracker Boone, the spiritualist Chakra (who became Traveller's lover), and the enigmatic Mr. Nacht. (Web of Spider-Man I#117/1 (fb) ) - After she was injured by escaping patient Shriek, Dr. Ashley Kafka, director of the Ravencroft Institute, was exhorted by her security director, John Jameson, to bring in someone to help her until she recovered. Kafka contacted Traveller, who agreed to come. (Web of Spider-Man I#117/1) - Traveller arrived at Ravencroft with the Host in tow, where Kafka and Jameson greeted him. Kafka brought Traveller to his office, then left to finish up some pressing paperwork. Traveller left to examine several patients in their cells, including the Chameleon, Shriek, and Carnage. Determining that they had all encountered Spider-Man, Traveller telepathically commanded the Host to enact his plan. While they took out Jameson and the staff and sending them out of the facility, Chakra contacted Spider-Man with Traveller's challenge; defeat him, and Ravencroft's inmates all go free, but if Spider-Man was to lose, the inmates would all be killed. Traveller himself teleported Kafka out of the building, then erected a force field around it. He went outside to greet Spider-Man; after shrugging off a SWAT officer's bullets, Traveller repeated his ultimatum to the web-slinger, who accepted and entered Ravencroft. (Spider-Man I#51/1) - Traveller and Nacht watched Spider-Man in his cell as they awaited Reilly's arrival. He ordered Nacht to allow Reilly passage through the force field, and told him to send Medea and Boone after the clone. While the Host battled Reilly, Traveller assaulted Spider-Man's mind, sending him to the brink of madness, but Parker conquered his demons and emerged with his sanity intact. When Traveller announced his intention to probe deeper, Spider-Man broke free of his shackles and burst out of his cell, but Traveller grabbed him. Reilly arrived, having beaten the Host, and knocked Spider-Man free, leaving Traveller confronting both Spider-Men. (Amazing Spider-Man I#400/1) - Nacht reported in to Traveller from outside the Parker home. Medea entered Traveller's study, eager to make their next move on Parker, but Traveller forcefully reminded her that they would act only when he decided to. (Spider-Man I#57/1) - Traveller and the Host found Mary Jane Watson, Parker's wife, walking in the rain. Telling the Host to stay back, Traveller went to talk to her in an attempt to understand Parker through the woman who loved him - and who he telepathically learned was carrying Parker's child. However, Reilly (now the costumed Scarlet Spider) was nearby; to keep him away, Traveller set off a series of massive explosions beneath the streets. Nevertheless, Reilly persisted. Traveller left Mary Jane with Reilly and departed with the Host. (Amazing Spider-Man I#401) - Learning that Kaine (secretly an imperfect clone of Parker) was endangering Mary Jane, Traveller had Chakra inform Parker (who had been wrongfully imprisoned for Kaine's crimes). Parker escaped from Ryker's Island, only to find Traveller waiting for him outside the prison. Telling Parker he was a fool to endanger his future by breaking out of jail, Traveller offered instead to project an illusion of him in prison while he saved Mary Jane. Parker agreed, and Traveller had Chakra transport Parker to the mainland. As they departed, Scrier suggested Traveller saw himself in Parker - but Traveller insisted that Scrier didn't truly know him at all, and never could. (Spider-Man I#59 (fb) ) - Traveller sent the Host to sabotage a geothermal energy plant in the East River as part of his latest test for Parker. (Amazing Spider-Man I#402) - Traveller brooded atop the Top of New York hotel, musing on his centuries of existence, and how he and the world would be truly redeemed when he found the true meaning of evil. Scrier arrived to question his latest plot, which could finally break Spider-Man. Traveller insisted that Spider-Man's life - all of their lives - were insignificant compared to Traveller's task. He transformed into a bird and flew off to Parker's apartment. There, he confronted Parker in his own mindscape, stabbing him repeatedly with a sword before offering him a choice - the restoration of his recently deceased Aunt May to life at the expense of another's life - a "worthless insignificant nobody". Parker refused, and set May's soul free, realizing that even Traveller didn't have that power. Traveller brought the triumphant Parker back to reality, into a vision of one day in the future - showing him a devastated New York and telling him that it was all his fault! (Spider-Man I#59) - In the wreckage, Traveller showed that Mary Jane would survive the cataclysm, giving Spider-Man the choice of preventing the Host from sabotaging the power plant - or letting them do it, and ensuring that all of Parker's tormentors would perish. Traveller restored them to the present, and stayed behind on Parker's roof to safeguard Mary Jane while Parker departed. Scrier visited Traveller during his vigil, warning him against straining his powers, but Traveller struck him down, cautioning Scrier against presuming himself to be Traveller's equal. 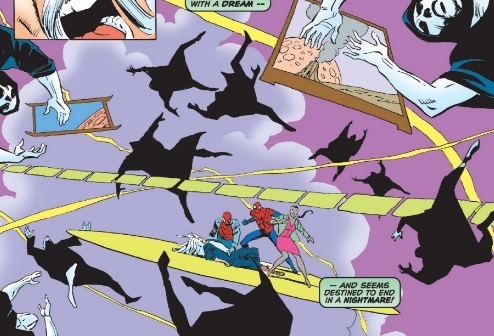 While Spider-Man successfully stopped the Host, a unstable transpatial time vortex opened up above the city - not the Host's doing, or Spider-Man's, but the result of Traveller's interference with time. The vortex began to consume Traveller, and he was besieged with memories of his long existence - from Biblical times to the Black Plague to the dropping of the atomic bomb. At great risk to himself, Parker saved Traveller from the vortex, leaving the confused psychologist with Scrier. (Web of Spider-Man I#126) - While Spider-Man battled Kaine in an alley, Traveller appeared, and teleported both of them away. (Amazing Spider-Man I#403) - To learn whether Spider-Man was responsible for the evil he fought, Traveller put Spider-Man on trial at Ravencroft, with himself as judge, Carnage as the prosecutor, Kaine, Kafka, and Jameson for the defense, and the other inmates (including Shriek, Chameleon, Carrion, and Vermin) as the jury. As Traveller explained, Kaine attacked him, attempting to burn the Mark of Kaine into his face - but Traveller was unharmed, and overpowered Kaine, shrinking him down to fit in the palm of Traveller's hand. He restored the pacified Kaine to his rightful size, and the trial began. Carnage called himself as his own first witness, but his cross-examination with Kaine turned into a brawl, ending only when Traveller stopped it. Traveller watched as Carnage then called Malcolm McBride to the stand, who revealed that he became Carrion due to his jealousy of Peter Parker - who Carnage dramatically revealed to the court was actually Spider-Man! Enraged, Parker broke free of his chains and angrily offered to let Traveller destroy him - if he had the chance to bring Kaine to court to clear Parker's name and save Reilly's life. Traveller was impressed - but sent the case to the jury anyway. They declared Parker guilty, and Traveller sentenced Parker to death, unleashing the inmates to carry out the sentence. Kaine leaped to his defense, but was quickly overwhelmed...only for Traveller to send the inmates back to their cells. He told Spider-Man that seeing a lost soul like Kaine sacrifice himself for Parker convinced him of Spider-Man's goodness. He found Parker not guilty, and told him that his investigation was concluded...for now. He sent Parker and Kaine back to where he had taken them from. Later, Traveller returned to Ravencroft to erase the knowledge of Parker's identity from the minds of Carnage and the other inmates. (Spider-Man: The Jackal Files#1) - The Jackal studied Traveller, and downloaded that knowledge into the evil clone Spidercide. (Amazing Spider-Man I#416 (fb) ) - Traveller became suspicious of Traveller, and had Chakra follow him. (Amazing Spider-Man I#417 (fb) ) - At Osborn's command, Boone, Medea, and Mr. Nacht turned on Traveller, capturing him and imprisoning him in an air-filled coffin at the bottom of a swimming pool at the abandoned JR's Gym. Chakra remained loyal to Traveller, and escaped. Man, Judas Traveller. Despite not actually having anything to do with cloning, he's the Spider-Man Clone Saga embodied in one guy. Super-mysterious, speaks in ominous riddles, and claims to have all the answers? Check. Thanks to multiple writers and conflicting editorial directives, nobody's quite sure what his deal is? Check. Over-complicated costume design, including a sick trench coat? Check. Actually kinda good? Well, check for me, at least...I came into comics with the Clone Saga, and I thought this dude was awesome. Now I realize that he was just mysterious for the sake of being mysterious, has a ridiculous costume, and is kind of out of place as a Spider-Man villain. I still kinda dig him, though. As noted by '90s Marvel editor Glenn Greenberg in the excellent Life of Reilly articles, nobody really knew what Traveller's deal was, even as his first appearances were being written - but J.M. DeMatteis had an affinity for the character, and enjoyed writing for him. And indeed, many of Traveller's more impressive feats - shapeshifting, time travel, reality manipulation - happen in DeMatteis' issues of Amazing, while from the very start, Tom DeFalco depicted Traveller as a more grounded trickster in the pages of Spectacular - in his first appearance there, Traveller plants a fake piece of mail! 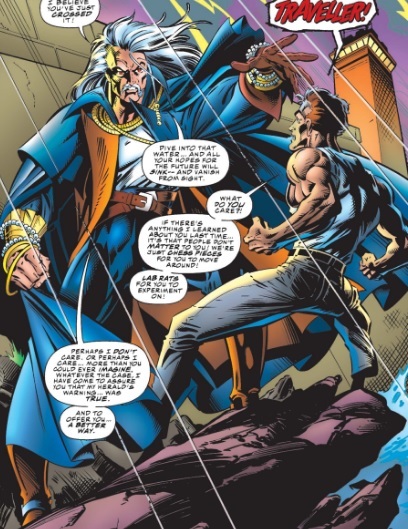 DeMatteis left the Spider-books halfway through the Clone Saga, while DeFalco remained, letting his depiction ultimately win out, as he wrote the issues where Traveller was revealed to be a deluded mutant illusionist. That said, there are a couple issues where DeMatteis hints that Scrier was the true power behind Traveller, which DeFalco did end up confirming, albeit in a wholly different way from what DeMatteis likely intended. So what did DeMatteis intend? My theory is that he was supposed to be the actual, factual Judas Iscariot, Jesus Christ's treacherous disciple, cursed to wander the Earth atoning for his betrayal until he understood the nature of evil. There are all sorts of things that fit - Traveller wears a noose around his neck, and according to Matthew 27:3, Iscariot hanged himself after betraying Jesus (according to Acts, however, Judas "burst asunder...and all his bowels gushed out", which is thankfully not the costume theme they went for). Traveller also wears silver jewelry around his wrists, which could be the actual thirty pieces of silver Iscariot was paid for delivering Christ to the authorities. 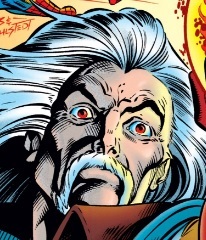 Furthermore, Traveller's interior monologue in ASM #402 indicates a divine origin of his powers, and suggests his quest to understand evil is to ensure the salvation of Earth from God's judgment. In Spider-Man #59 (which is by Howard Mackie, not DeMatteis), Traveller flashes back to the inhumanities he witnessed, and among them is a scene of several people being crucified. Plus, DeMatteis greatly enjoys writing about religious and spiritual issues in a superheroic context - check out his run on DC's Spectre. A couple other rejected ideas for Traveller's identity are depicted in the 101 Ways to End the Clone Saga one-shot - one is that he's a future incarnation of Ben Reilly's friend Seward Trainer (who took on the name Judas because he betrayed Peter Parker by falsifying tests to make it seem as if Ben was the original Parker), and another is that he and Scrier were advanced virtual reality holograms created by the Master Programmer (the disembodied consciousness of Dr Octopus). Traveller is famous enough that Spider-Man recognizes him right away when he shows up for the first time at Ravencroft; Kafka also doesn't say anything when he shows up dressed like a pirate Dracula, so we're left to assume that respected criminal psychologist Judas Traveller just always wear that...and, for that matter, that Judas Traveller is his real name. According to the Osborn Journal one-shot, Traveller's nervous breakdown happened around the same time that Roderick Kingsley became the original Hobgoblin; Osborn chose to deal with the former instead of the latter, explaining why Norman never took on Kingsley during his original stint as the Hobgoblin. Judas Traveller received a Handbook profile in All-New OHotMU Update#1.